The CW sesaon was slow out of the gate. CW: The season premiere of THE FLASH was down 0.3 from 2017 to 0.8. More troubling was the season premiere of BLACK LIGHTNING, which was down 0.4 from last year’s series premiere to a series low 0.4. ABC: The AMERICAN MUSIC AWARDS fell 0.6 from the 2017 edition (on a Sunday) to 1.8. NBC: THE VOICE was steady at 1.8, and THIS IS US slipped 0.1 to 2.3. NEW AMSTERDAM is currently down 0.1 to 1.4, although its 10:01PM start time has made it susceptible to downward adjustments in finals. 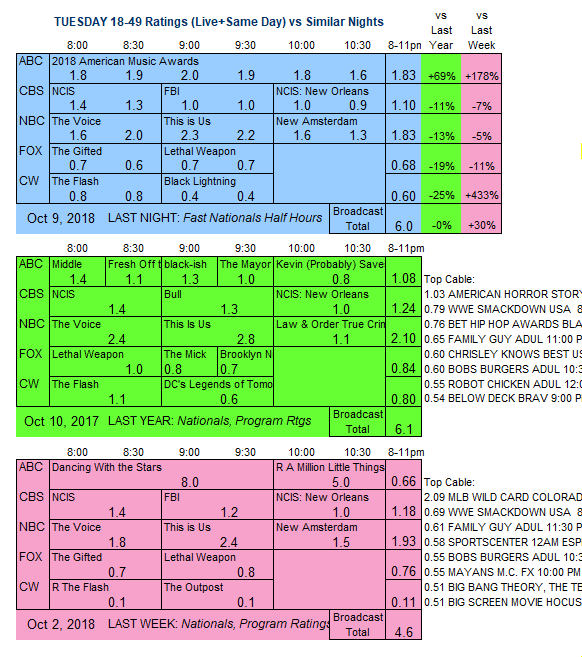 CBS: NCIS held at 1.4, but FBI fell 0.2 to 1.0. 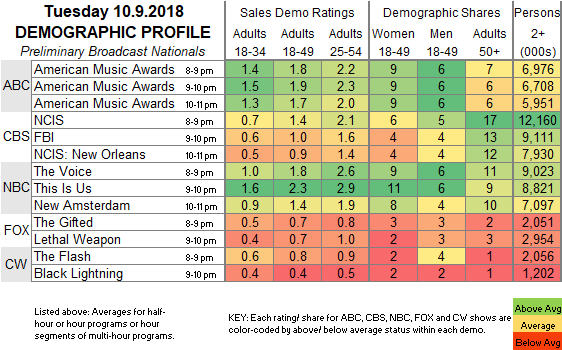 NCIS: NEW ORLEANS was down 0.1 to 0.9. FOX: THE GIFTED was steady at 0.7, and LETHAL WEAPON lost 0.1 to 0.7. CW introduces the drama ALL AMERICAN tonight after the season premiere of RIVERDALE.